This exciting robotics experience provides 8 teams of 4 children completing grades K-3 the opportunity to design solutions for real-world science and technology challenges by programming the fun and engaging robot duo, Dash & Dot. Computer science education teaches young children valuable school and career readiness skills such as critical thinking, collaboration, communication and creativity. At the end of the event, teams will demonstrate their new skills by programming the robots to complete a team challenge! Family and friends are invited to attend the showcase at 11:30 a.m. No experience needed! Register Online by July 6 -- Register now! By July 20, your team's lead coach will receive an email regarding your team's status -- invited to participate or on waiting list -- based on first come, first served selection process. The Clover Kids Robotics Packet with participation guidelines, team forms, and additional details. Tickets to the Iowa State Fair for the day of the event for each team member and two coaches. Bratney Companies Robotics Challenge T-shirt and book about robots for each team member. Wonder League Robotics Competition from Wonder Workshop provides an opportunity for children ages 6-8 to learn to code while tackling collaborative, story-based missions using Dash & Dot, plus a whole lot of critical and creative thinking skills! Wonder League teams participate in three rounds of missions over a five-month period. There is no cost to participate in Wonder League and completed missions are submitted virtually. Please note, the Iowa 4-H Program does not support competitive experiences for Clover Kids (K-3) members. However, Clover Kids may exhibit or showcase their work in a noncompetitive event or activity. In order to align with this policy, the Iowa 4-H Program will host a noncompetitive Clover Kids Robotics Exposition in central Iowa during the spring of 2019 (date & location TBD) for teams to showcase their Wonder League achievements and celebrate their accomplishments. 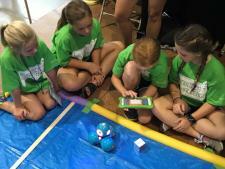 Teams that attend the Clover Kids (K-3) Robotics Learning Experience and Showcase at the Iowa State Fair will have the opportunity to check out a Robotics Kit (includes Dash, Dot and a tablet) in order to participate in Wonder League. 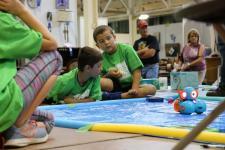 Do you know children who enjoy working with robots, solving challenges, design solutions, and working as a team but are not able to participate at the Iowa State Fair? No problem! We encourage you to form a Wonder League team and join us at the spring Clover Kids Robotics Exposition! No experience is required - all that is needed is a willingness to try! Stay tuned for more information regarding Wonder League and the Iowa 4-H Clover Kids Robotics Spring Expo! Contact Nicole Hanson with questions.